What is the purpose of the mobile training facility? Franklin Electric’s mobile training facility is the newest tool added to our already expansive training and service toolbox, providing hands‐on training for distributors, contractors and installers in the water systems industry. This easily maneuverable truck‐trailer combination provides the opportunity to take products and training directly to the field. What kind of service does the mobile training facility offer? This rolling showcase is equipped to highlight two major product areas for Franklin Electric: drives for constant pressure applications and sump, sewage, and effluent pumps. The mobile training facility can easily be converted to showcase one or the other of these product lines, offering a showand‐tell forum to answer questions about these products and their installations and applications. When/where is the mobile training facility available? The mobile training facility may be scheduled for an event or training seminar in the continental United States through a Franklin Electric representative. Events will be updated on this site as they become available. How can the mobile training facility be used/utilized? 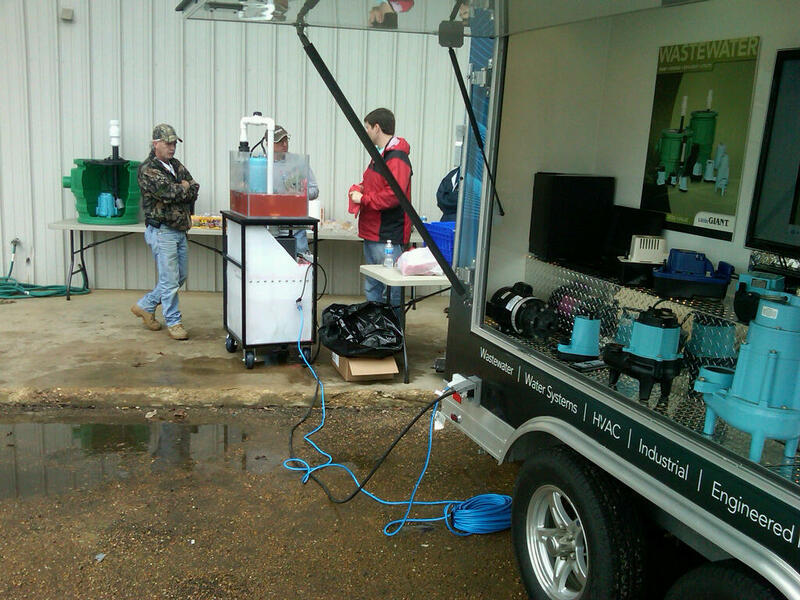 Franklin’s mobile training facility is designed to provide hands‐on experience at local venues. Not everyone can make a trip to the factory or attend a trade show; now real‐life product demonstrations and training can be brought to them. Why did Franklin Electric choose to create a mobile training facility? After many successful years of training thousands of contractors/installers at our factory campuses, hotels, conventions and dealer meetings around the country, Franklin Electric wanted to find a way to connect with those who were unable to attend such events. The smaller scale and complete maneuverability of a mobile training facility allows Franklin to take the training experience directly where it is needed. Who provides the mobile training facility demonstrations? 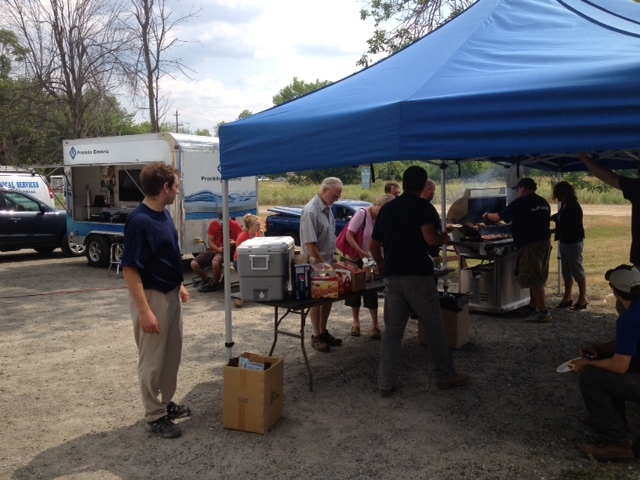 Franklin Electric sales and service personnel are present at all venues. Their knowledge and experience provide practical insights the contractor can use in the field. A technical leader in electric motors, pumps, drives and controls, Franklin is the world’s largest manufacturer of submersible water well and fueling systems motors and a manufacturer of underground fueling systems hardware and flexible piping systems. 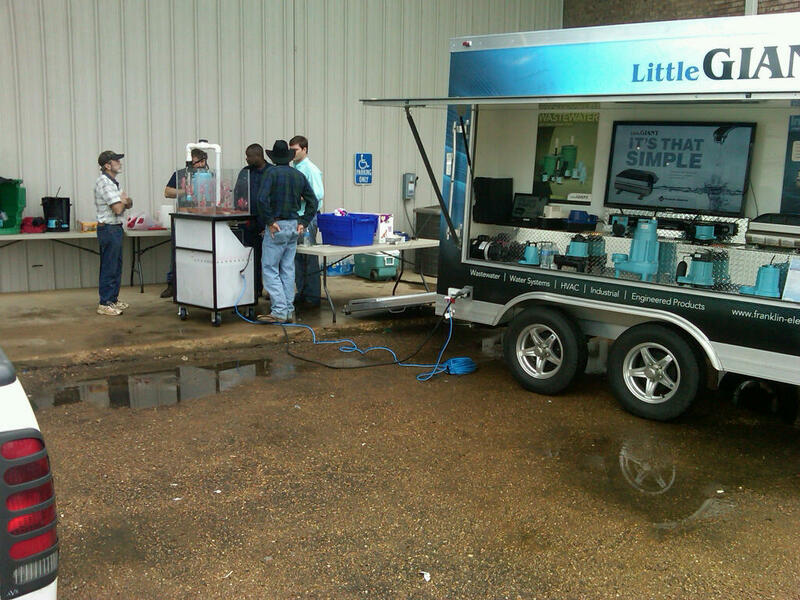 January 10, 2012 – Jordan Davis (in the red jacket) of Davis Marketing demonstrates the operation of the Little Giant grinder pump to plumbing contractors. Also pictured, a sampling of the sump, effluent, sewage and HVAC pumps that Little Giant offers. Want to know where the MTF will be next? Check the schedule.